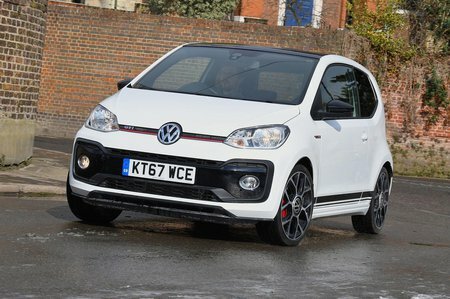 Volkswagen Up GTI Performance, Engine, Ride, Handling | What Car? Let’s begin with the heart of the Up GTI: its 113bhp engine. When you consider that most three-cylinder turbo units need to be worked like a washing machine on fast spin to get them going, this one’s a revelation. Okay, it's not as explosive as an Abarth 595, but it’s a darn sight quicker than a Renault Twingo GT and so grunty that you can pull away from a standstill in second gear if you’re feeling lazy. On the move, the Up GTI will haul itself up a hill in third gear from a little over 1000rpm. And there’s nothing lazy about the power delivery; the rev counter zips readily round to the redline and this, thanks to the three-cylinder’s cheeky (albeit digitally enhanced) chirp, is a pleasure to do often. 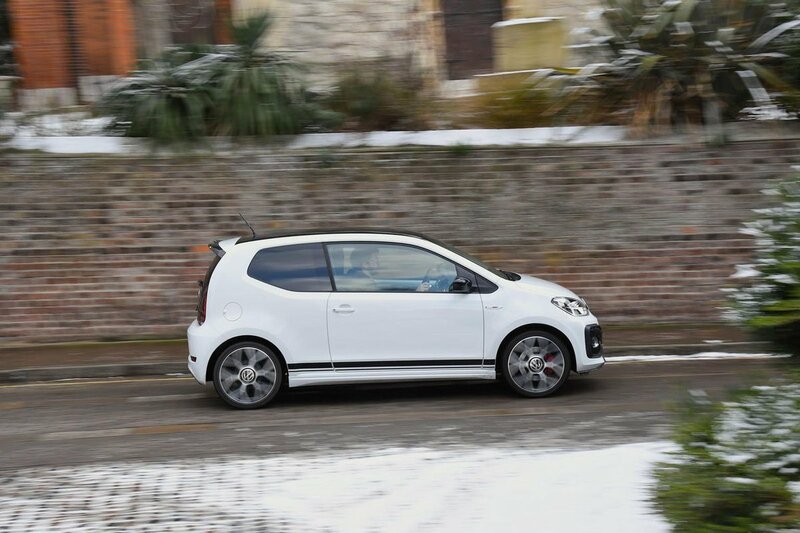 The standard six-speed manual gearbox’s well-spaced ratios play a part in the Up GTI’s verve, while the slick gearchange, positive clutch action and progressive brakes make it feel more refined than any city car has the right to be. In city car terms, wind and road noise aren’t overbearing at speed, either. Now, the Up has always been a tidy-handling thing in regular form; with its sports suspension dropping the ride height by 15mm over the standard car, the GTI feels even more tenacious. It puts its power down with good effect, changes direction sweetly and hangs on gamely through bends like the jaws of a Jack Russell on its prey. 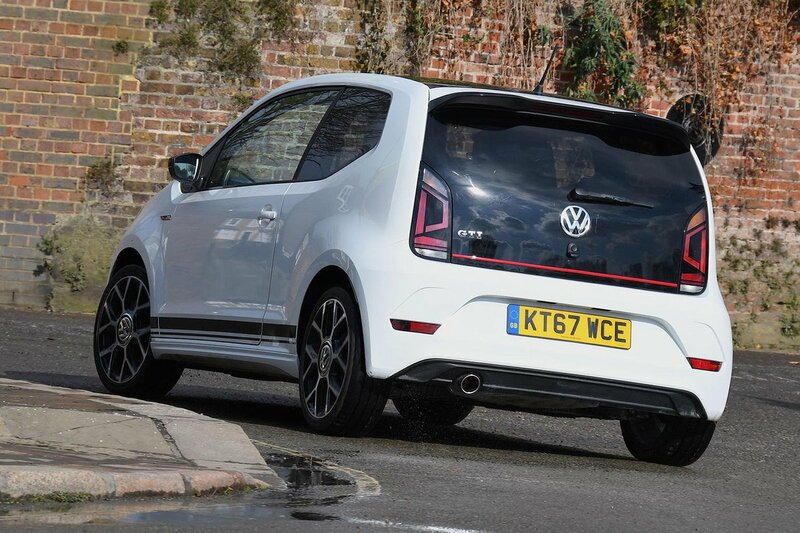 Simply speaking, dynamically the car wipes the floor with similar-sized rivals such as the 595 and Twingo GT. Yet, anyone still clinging to the belief that the Mk1 Golf GTI’s spirit lives on here will surely feel there’s been a ritual exorcism – the Up GTI lacks the last layer of polish to be considered of that illustrious ilk. Sure, the steering possesses good gearing and weight, but little in the way of feel, while its chassis hasn’t got the composure or balance to be considered among the true greats. However, for a car costing less than half as much as a Honda Civic Type R, that’s absolutely no disgrace, and by dint of its small proportions and vivacious character the Up GTI is still good fun to drive. It’s also worth bearing in mind that the stiffer suspension and 17in wheels shave the edge off the regular car’s compliancy over bumps, particularly over scruffy town roads and speed bumps that cause it to buck and bob slightly. Mind you, it is no boneshaker and is far more relaxing to potter in than the jittery Twingo GT.